Adele won every category in which she was nominated and now shares the record with Beyoncé for the most wins by a woman in one evening. ADELE WAS THE big winner at last night’s Grammy Awards scooping six awards, including the Record, Album, and Song of the Year awards. The London singer won every category in which she was nominated and now shares the record with Beyoncé for the most wins by a woman in one evening. She beat off competition from Bon Iver, Bruno Mars, Mumford & Sons and Katy Perry to take Record of the Year with Rolling in the Deep, the best-selling single in America in 2011. The other big winners on the night were Foo Fighters who won five Grammys. “To me this award means a lot because it shows that the human element of making music is what’s most important,” Dave Grohl said as he accepted the award for best rock performance. “Singing into a microphone, learning to play an instrument and learning to do your craft, that’s the most important thing for people to do. It’s not about being perfect”. Bon Iver won Best New Artist, beating off competition from Nicki Minaj who arrived at the ceremony accompanied by a pope look-a-like. Show organisers were criticised for allowing Chris Brown to perform, the first time he played at the Grammys since he dropped out of 2009′s awards after attacking then-girlfriend Rihanna the night before it was due to take place. Singer Jennifer Hudson paid tribute to Whitney Houston who died the night before the awards ceremony took place. Hudson sang I Will Always Love You during the In Memoriam part of the show, appearing at several stages to be in tears during the song. The night had started on a somber note as host LL Cool J led the audience in a prayer to “our fallen sister”, telling the audience: “There is no way around this. we’ve had a death in our family”. The show also held a tribute to the recently reunited Beach Boys that featured Maroon 5, Foster the People and the three remaining members of the California band. 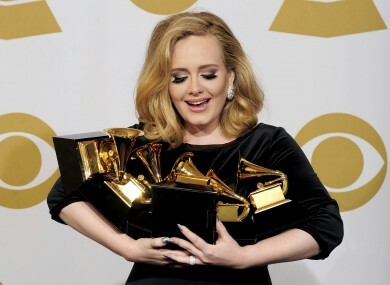 Email “Adele and Foo Fighters win big at the Grammy Awards”. Feedback on “Adele and Foo Fighters win big at the Grammy Awards”.